The Pepsi Refresh Project featured an artical about the Scraper Bike King on their blog. Click the link above to see more. How do you get teenage boys from under served neighborhoods to maintain a healthy GPA and stay out of trouble? Each year, a big chunk of our federal education budget is earmarked to figure out this very question. Non-profits like Harlem Children’s Zone and Green Dot Public Schools have both built brilliant models and boast impressive statistics on retention and closing the achievement gap. But there may be one element as important in reaching that coveted (and notoriously difficult to retain) demographic: the cool factor. “Kids work on scraper bikes because it’s something they want to do and they think it’s cool,” says Tyrone Stevenson, the 21-year-old founder of the budding non-profit Scraper Bikes. Scraper bikes are equal parts art project and pragmatic transportation. 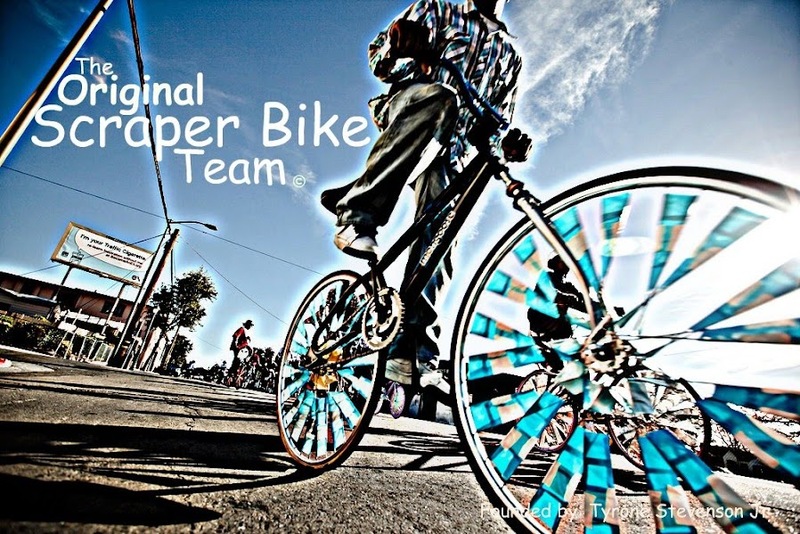 Far less than the cost of a scraper car – the lowriders from which the bikes borrowed their name – scraper bikes are tricked out using foil from candy wrappers and soda cans, their frames painted with spray cans from the .99 cent store. “The frames are donated or found around the neighborhood,” says Stevenson. The oversized wheels may be the most expensive component, but all told, a scraper bike can be built with a few dollars and some sweat equity. “Kids show up at my house every day of the week to work on their bikes,” says Stevenson. These are not just any kids. In order to join the scraper bike team you must come with your report card and demonstrate at least a 2.0 GPA (Stevenson checks them every week). While academic achievement and sustainability have not exactly defined street cool in the past, the tactic appears to be working: the group began with just eight or nine and now has almost a group of 40 mostly 13-16 year-olds. Stevenson’s car free movement has moved beyond East Oakland thanks in large part to the group’s You Tube video which has received over three million views. This is awesome -- I'm so glad you guys are getting such great attention!